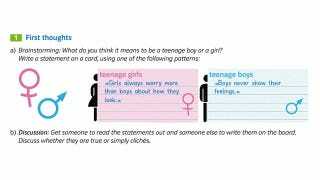 Are Educational Materials Challenging Or Reinforcing Gender Stereotypes? Andi S-R. noticed an interesting segment in a German textbook used to teach English. In the last few years, 12th-grade English classes have started including a section about gender, so textbooks have added chapters on the topic. Andi found a supplement from Klett, one of the major German publishers of educational materials, provided a supplement for covering gender that included a brainstorming exercises. While the idea was to foster discussion about gender stereotypes, Andi questions whether the sample comments provided as examples would help with that goal or would prime students to focus on stereotypical behavior by providing it as a model (above). …it's unclear how students are supposed to know if these are "views" or "facts", and having a discussion based on gut-feeling alone seems only likely to reinforce and teach as "facts" those stereotypes the students are familiar with, anyway.